The Sit N Cycle Exercise Bike has received a mixed reaction and approval ratings. Some reviews have argued that this machine is not worth it while some think it is averagely good. However, we are going to present a unique review based on a thorough research and of course, Amazon customer reviews as well because that will further help us to determine the level of acceptance of the Sit N Cycle machine by its users. Dorothy Hamill of Sit N Cycle has declared that this machine is a handless and a low-impact exercise bike that is great for people of all ages to use; that you can burn calories by simply pedaling on the bike with less effort. This is a claim by the one-time Olympic skater but we will soon know if this narrative is completely true or false. Sit N Cycle has put in so much in promoting this handless machine with the impression that any user can achieve weight loss and fitness goals and you may have probably seen it on the TV too. Well, it appears to be like a machine one could use to keep the legs busy instead of just sitting on the couch. The manufacturer claims that this unit is for the elderly and those that hardly have time to do most things let alone exercising. That it will allow users stay in shape no matter how hyper-busy they could be. This is a unique machine without handlebars but has pedals with resistance. They also refer working out with it as ‘’active sitting’’ due to the nature and the design of the machine that would allow you to just sit without your hands doing anything but your legs only. This will allow you to work out and still enjoy doing things you would ordinarily do while sitting, like watching your favorite TV show, knitting, talking on the phone, surfing the internet and even reading as well. According to their TV ads, they gave the impression that it is extremely easy to use while you achieve physical fitness and weight loss. We must confess that they made it look like the big deal on the TV commercials. This is an indeed one of a kind and unique cardio machine but we shall find out to what extent it can really affect your physical fitness positively and also the quality level. Unfortunately, they did not state the type of material they used in making this machine but from all indications, it has 80 to 85% plastic material and we can’t say how good these plastics are. People have complained about the parts falling apart after few months of use and that the pedals keep coming loose frequently. Although, the company claimed that they have resolved that problem and won’t happen if the machine is properly assembled. From the looks of the machine, one will wonder how a machine with a small base and without any handlebars can be stable. However, they have made us understand through their aggressive ads that this unit is stable once it is used at moderate speed on a floor that is even. 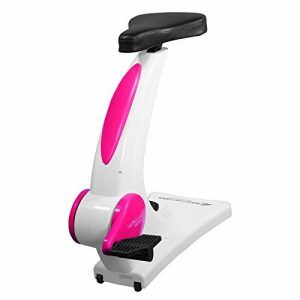 This is understandable; the Sit N Cycle Exercise Bike has to be of course on a flat floor for it to be operatable because the base or the feet are not adjustable. It the machine does rock during use then you may have to improvise by using something to level the floor or better still use a rubber mat perhaps. The seat is the only adjustable feature on this machine. The seat can be adjusted upward or downward by loosening the adjustment knob underneath the seat and pull it up or down to achieve your desired position that will suit you. The adjustment knob, when loosened will reveal preset holes on the seat bar that will allow you to select the preferred hole and position to insert the knob and tighten it into position. According to Sit N Cycle, this machine can accommodate individuals of different sizes (5ft to 6ft 4 inches). However, from the way we look at it, we don’t think it will be all that convenient for individuals of above 5ft 10 inches because they will not be able to achieve full leg extension which could cause injury or pains on the knees. Therefore, individuals of about 4ft to 5th could conveniently use this machine and feel comfortable with it. Although, being too short in height could result in inability and struggle to reach the pedals from the seat as well. The only thing to do in order to use this machine conveniently and comfortably is to use the adjustment knob that is designated at the back and beneath the seat to adjust to perfect position by loosening the knob and pulling upward or downward as the case may be and insert the knob into the right hole on the seat bar/pole and tighten up. The seat adjustment can be a good way of securing the seat as well but it may not be entirely great for some individuals because they could feel that it is either slightly too long or short from seat to pedals. But, that is the only available adjustment on the Sit N Cycle though. 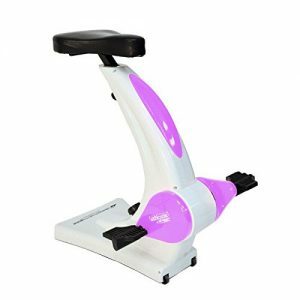 The Sit N Cycle is integrated with 8 levels of resistance that is designed to offer a challenging pedaling that could burn fat and lose weight. You have to set the resistance to your desired level before you get on the bike and have to get off to change it if you wish to do so. The resistance knob is somewhere close to the base on the seat stand. The adjustment of the resistance is pretty easy but the only problem is that you can’t make a change of resistance level while working out as seen with most cardio machines but you have to get off the machine to do that which can annoy some people. You won’t enjoy the liberty of adjusting to different levels of resistance to experience uphill and down workout without having to stop. This is a total disruption of workout experience. The resistance has the ability to get the heart rate up and offer the feeling of challenging workout because you can change it from easy to the moderately hard resistance level. The sole purpose of this machine is to get people that sit around so much to get active without losing the feeling of sitting, in other words, to sit while you exercise and getting healthier. It has a magnetic resistance system that is famously known for smooth and quiet workout operation. The Sit N Cycle machine comes with a belt drive type that is supposedly wider and stronger oppose to what it used to be earlier on. The company has stated that they have made their belt drive a lot more quality and durable after users complained of how the belt drive gave issues. Therefore, they expected the belt drive to stop developing problems after the changes they have made on the belt drive and of course, the belt drive operates without noise and it is smooth as well. 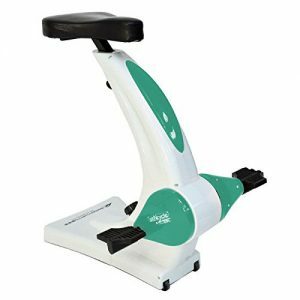 The Sit N Cycle’s pedals are designed like that of the recumbent bike. It is not a recumbent, not even close but it has its pedals positioned in a forward position like the recumbent bike. It doesn’t have the reclining seat with a backrest but it does have its pedals in a forward position. This could explain why some people have complained of back pain because it lacks the backrest that could allow them to recline and ease the tension on the back. Some people have also complained of the pedals coming loose after using for a while. This problem disrupts their workout because they have to keep on tightening each time it comes off. However, that problem was attributed to incorrect assembly of the pedals because the left side of the pedal’s thread is on the reverse, therefore; you have to put the pedals correctly. This can be confusing because you have to tighten the left pedal in an anti-clockwise fashion to have it stuck the way it should be. We think this should have been made known to users on the instruction manual to avoid unnecessary stress. Does the Sit N Cycle offer convenience and comfort? Well, it has a large adjustable seat that could help in accommodating different sizes of users. This, of course, will help in terms of comfort. However, not everyone will experience the same comfort level because of individual size and weight difference. You may also have a gel seat cover ordered in order to maximize the comfort from the seat. If padding the seat with a gel seat cover doesn’t increase the much-needed comfort then one can choose to change the seat completely but unfortunately, that may be impossible because of how the seat is designed. Getting on the machine may be a problem if you are not all that tall and therefore you may need something like a step to help you get on the bike. Some people have complained of back pain due to lack of backrest and handlebars. Also, some people have also complained of not feeling safe while working out with the machine due to the fact there is no handle to hold on to. This may be very difficult for the elderly because they will have to struggle to steady themselves while they work out. You will have the liberty to enjoy your favorite TV shows because of its smooth and quiet operation and you don’t have to worry about disturbing the family or the neighbors. Not only that, you can also do stuff like browsing the internet, reading or making calls with your phone if you are not having an issue with being steady on the bike. The Sit N Cycle bike does not require any special maintenance because even the drive system is a belt type. You only need to wipe it clean of sweat and dust after workouts and when you think dirt/dust has settled on it. Putting away this machine is very easy because it is a lightweight machine with transport wheels that will aid in relocating to another place. It weighs about 34 pounds which is a pretty lightweight for anyone to move conveniently with the transport wheels. However, the wheels are small and may get sticky when used on a carpet or other soft floor surface but they still help in relocation and storage. On the other hand, it will be pretty easy to use the transport wheels on a hard surface floor, the only issue is to be careful not to leave any dent on the floor during the process of relocating the machine. This version of Sit N Cycle Exercise Bike does not come with a console and therefore you will not be able to track your workout progress. It depends on what you want, whether you need it with or without a console all depends on you. If you need a console to be able to track your workout progress then you should opt for the one that has a console. Although, the one that comes with a console is costlier than this one that doesn’t have one. We do think that console will surely help a great deal to achieve your fitness goals because you will be able to track your speed, distance, calories burned and even more. This will serve as a motivation when you know that you are burning a lot of calories and improving in speed and distance. The version that comes with a console always has it situated somewhere below the seat in a panel that pops up toward the top and you have to observe the workout data by looking down at your legs. There are 6 different workout data that it displays but has the speed data constantly displayed and one of the other 5 such as the total distance, RPM, time, calories burned and distance. It doesn’t include the heart rate data. The console has a scan function that you could use to scan through the workout data or use a button on the console to decide on which of the workout data you wish to view one at a time. It does not have the capability to connect to any fitness website, account or upload/transfer data. The console requires AAA battery to function which may not be included upon purchase of the Sit N Cycle Exercise Bike. Assembly has been reported to be very easy as there is no much part to be assembled. You need to pay attention and follow the instruction manual to avoid issues like fixing the left pedal wrongly. The machine comes with the tools needed for assembly and also delivered with most of the major components preassembled. Therefore, it could take you less than an hour to fully assemble it. This machine does not come with any accessories and we can understand why. The design does not even make room for any accessories like water bottle holder or tablet holder. Nevertheless, you can only improvise by using a table that is adjustable to serve as your water bottle and phone or tablet holder. You can also use that for your laptop as well if you have to. The shipping cost of the Sit N Cycle Bike depends on where you are purchasing the product from as different retailers have different shipping policy. However, Amazon usually delivers this machine free of charge. It has got 8 levels of resistance that offer light to moderately hard challenging workout experience. The seat is adjustable therefore most users may find comfortable positions to work out on. It allows you to work out and still enjoy watching your favorite TV shows, talking on the phone, and reading. The resistance level cannot be adjusted without disrupting your workout by getting off the machine to change the resistance level. The seat cannot be replaced with another if there is the need to increase comfort. It does not have a console and would have to pay more to get the version that has one. The Sit N Cycle has about 18 Amazon customer reviews with an approval rating of 4.2 out of 5 at the time this review was written. This goes to show that majority of its customers are impressed with the machine and will recommend it, while there are those that have really bad things to say about the machine. Some of the things have to do with bad customer service, the belt drive and pedal falling apart, and not been told the real price of the machine until they used their credit card to discover that they have been deceived. These are serious complaints we think that the company should look into and fix. But that does not mean that majority of the people didn’t find the machine useful and satisfactory. If you are interested in this machine, go to Amazon and find out the real price that will not change after you have made your order. We also think that this machine is not designed for high-intensity workout otherwise it will break down as soon as you buy it. It is made to keep people active instead of sitting idle on the couch. Therefore, this bike is not a very solid bike that can withstand hard use without falling apart. If you are looking for something that could help you low-impact workout then this bike might be it. But there is no guarantee that you may not feel the back pain experienced by some users due to lack of backrest and handlebars. If you are not sure whether to buy the Sit N Cycle Bike or not, we will recommend taking a look at our recumbent bike reviews that will surely help you to decide on the best recumbent bike within your budget range. The recumbent bikes are very good low-impact bikes that are gentle on the joints including the back. The benefits of the recumbent bike are great. If you do have any further questions please do not hesitate to ask as we shall be glad to respond accordingly.